Mindstorms: Children, Computers and Powerful Ideas by Seymour Papert is a brilliant book. It’s as relevant today as it was when first published in 1980. Its applications to learning and teaching in 2013 are no less than startling. Mindstorms ranks in the top ten education books I’ve read. It describes not just how children develop intellectually, but frames the role that educational technology plays in teaching and learning. In Mindstorms, Papert shares his experience and research with the program Logo, a program he designed with a team at MIT to teach children how to write computer code. Quite a feat, considering that learning to code at that time was reserved for computer science, undergraduate students. But the book is not about the tactics used to teach children a new type of language—computer code, nor is it about using a structured linear framework to teach children how to think, but rather it is about learning; how children approach learning in a novel way. It provides a window into the cognitive processes of children through the lens of their phases of development as theorized by Jean Piaget. The four stages of a child’s development are a hallmark of Piaget’s work—Piaget’s influence on Papert’s’ work was significant. Deeply interested in learning theories, Papert worked closely with Piaget at the University of Geneva between 1958 and 1963 conducting epistemological studies with children. Papert moved to MIT as a research associate in 1963, and it’s during that time he developed Logo. 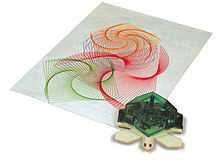 It uses a turtle as the object that the student controls through a series of instructions he or she writes that drives a pen mechanism allowing the child [programmer] to create a design on a sheet of paper. The results from Logo are quite extraordinary. Through learning to code, children connect with mathematical concepts by experiencing math through everyday movements (instructing the ‘turtle’ to move left and right) and by drawing upon what they already know (the book explains this idea far more completely and succinctly than I do here). Though it’s Papert’s exploration into the process of ‘debugging’ that demonstrates how Logo served as a tool to develop skills leading to critical thinking. Debugging is essentially fixing a mistake, which students identify, not the teacher. And students learn with logos to expect mistakes, known as ‘bugs’, and are eager to fix their mistakes or ‘debug’. Debugging entails students’ analyzing their code, their work, determining where they went wrong. Papert describes the process as student driven, but where the teacher is there to give feedback, direct and support the students (pg. 101 – 102). This skill, debugging—analysis or problem solving or whatever we call it, is crucial to learning, and is transferable to real life leading to critical thinking. In the second edition published in 1993, Papert describes in the preface, the procedure of debugging ‘as the essence of intellectual activity’ (pg. xvii). The book is an essential read for educators, especially teachers of elementary students, parents and administrators. I say essential because Papert touches on and explores numerous issues that educators are dealing with today. Mathophobia for instance that turns students away from math and science (pg. 38 − 54). Also, how culture affects learning. Papert is heavily influenced by Piaget on this issue—Papert believes that a culture’s materials influence a child’s development, specifically when it comes to building logic and math skills (pg. 20 − 24). Papert also addresses the fears of the negative effects of computers; fears held today by parents and educators. Papert makes it clear, the computer is a tool, as is logo for teaching and learning. The teacher is not replaced, but supports learning through feedback and direction. This book is full of insights and perspectives on learning that are thought-provoking, and applicable to the learning challenges facing educators today. The themes and takeaways of Mindstorms are just as applicable today as they were thirty years ago, perhaps even more so now. And my favorite takeaway, is that technology whether hardware or software, such as logo, is a tool for learning, not the solution. I close with this one minute clip of Papert speaking, about one laptop per child program. Even in one minute, one can see Papert’s passion for educating children.